Mix the flour mix thoroughly until all of the ingredients are well blended. 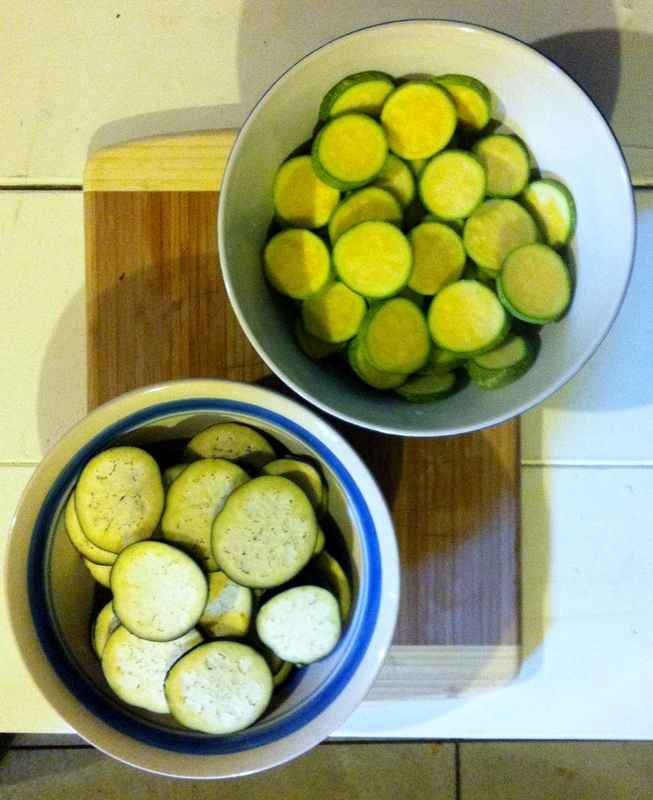 Take a handful of zucchini and eggplant slices (I do them one vegetable at a time, but it really doesn’t matter). 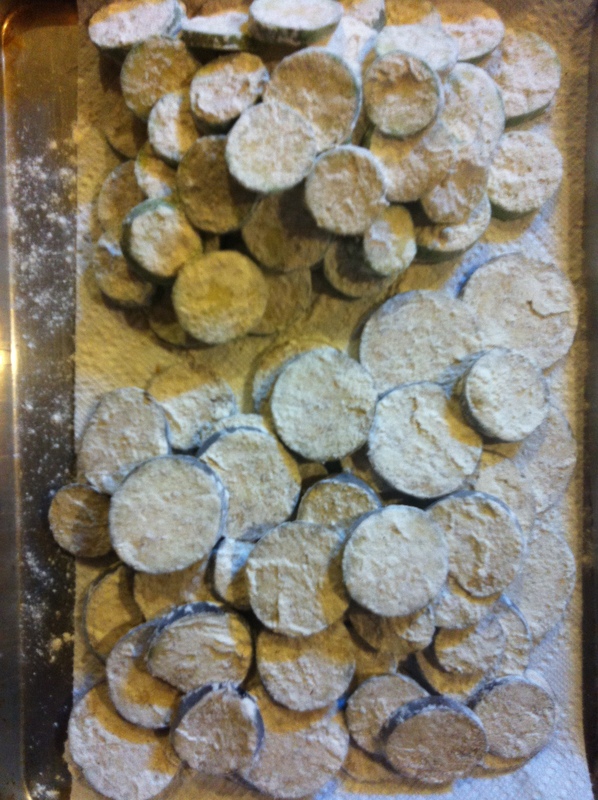 Coat front, back, and sides of each disc, tossing them into the flour with your hands, and place on a paper-towel lined baking sheet. 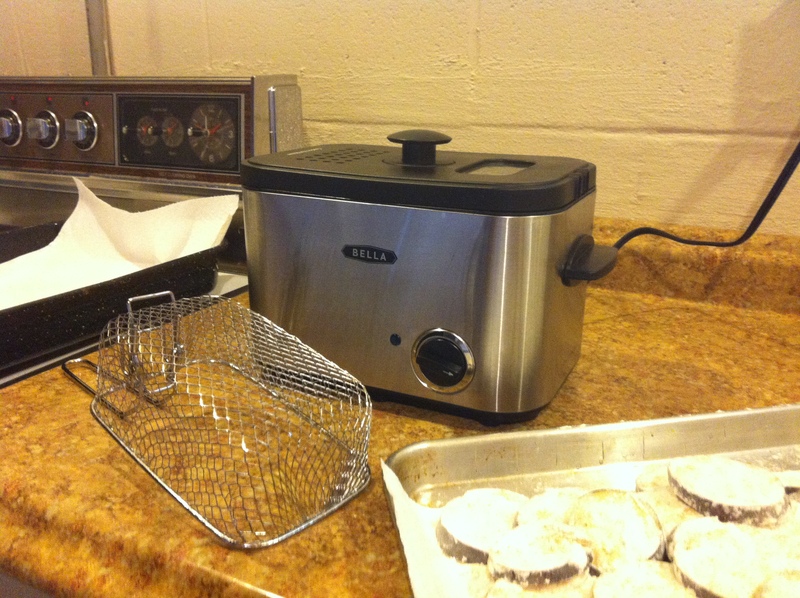 Now you’re ready to fry these up – I used the BELLA 1.2L Deep Fryer and filled with vegetable oil to the ‘max level’ indicator line in the basin. 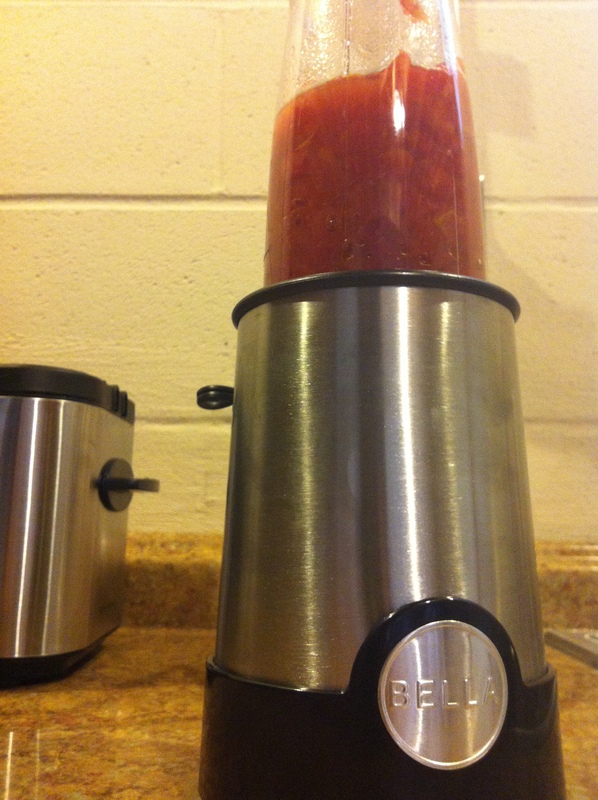 The folks at BELLA sent me a number of awesome kitchen appliances and accessories, and as I use each one, I see that I am cutting time in the kitchen leaving me more time for my favorite part…entertaining. Adjust the fry temperature to 375 F, and once ready (as indicated when the light turns off), drop about 15-20 floured slices into the basket and drop into the oil. I used a fork to gently submerge all the pieces, covered it, and allowed to fry for 6 minutes. If you slice the vegetables too thin, they will over-brown; you also want to make sure that you have uniform pieces and consistently slice them to the same thickness. After 6 minutes, remove the basket, drain excess oil, and drop into a paper-towel lined roaster pan (I find this works well). Repeat the process until all pieces are fried, crispy, and golden brown. 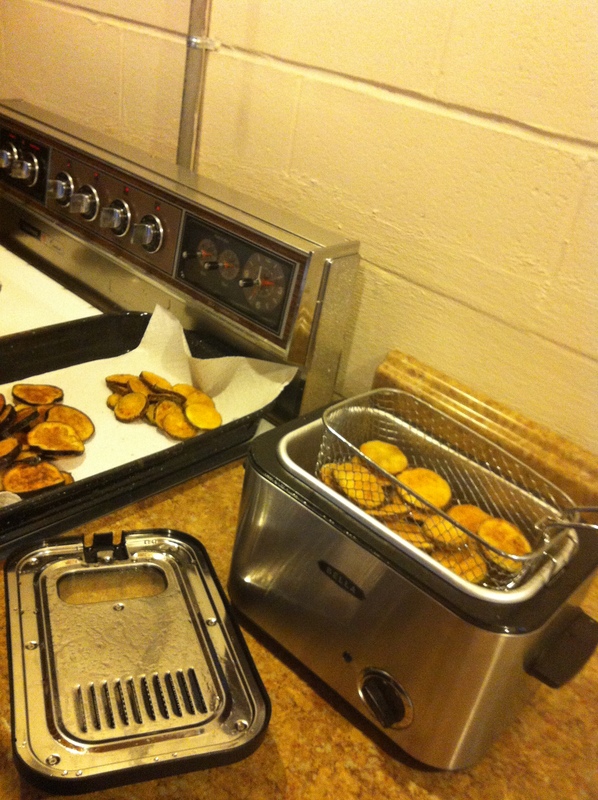 Once all the pieces are fried, prepare your ‘post-fry sprinkle’ by combining 3 tbsp. 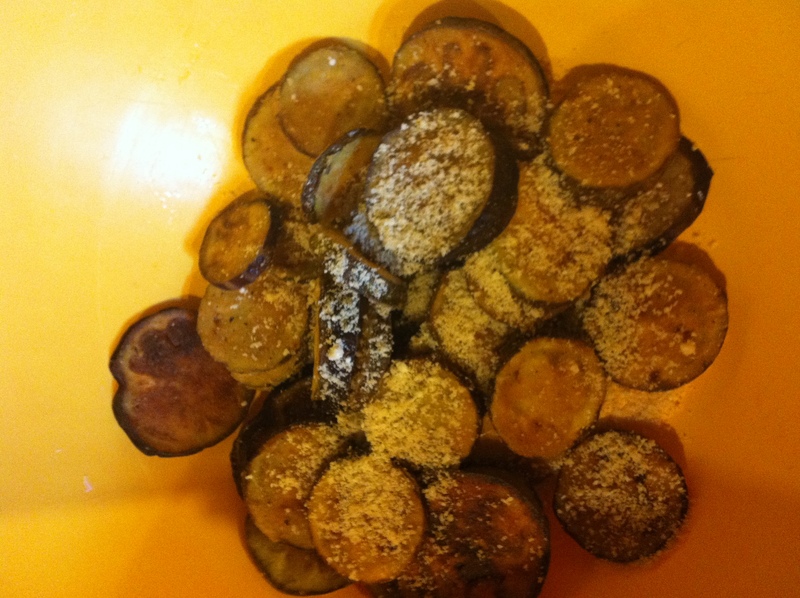 grated parmesan, 1/2 tsp. salt, and 2 tsp. 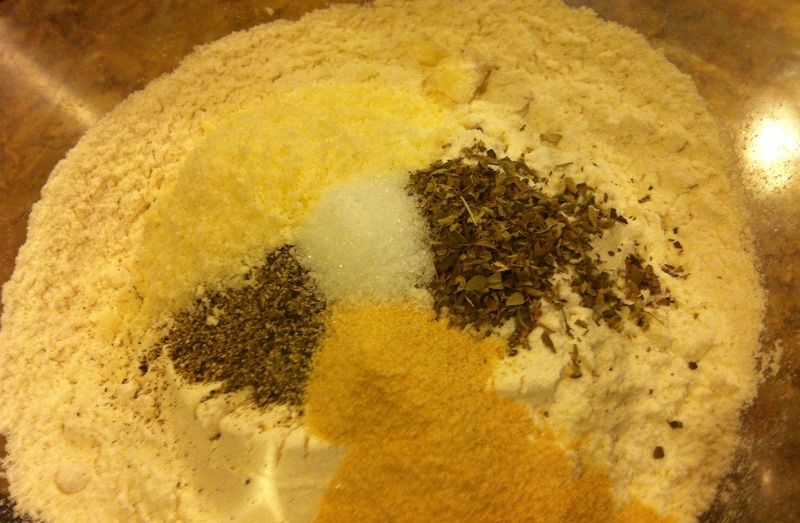 garlic powder in a small bowl. 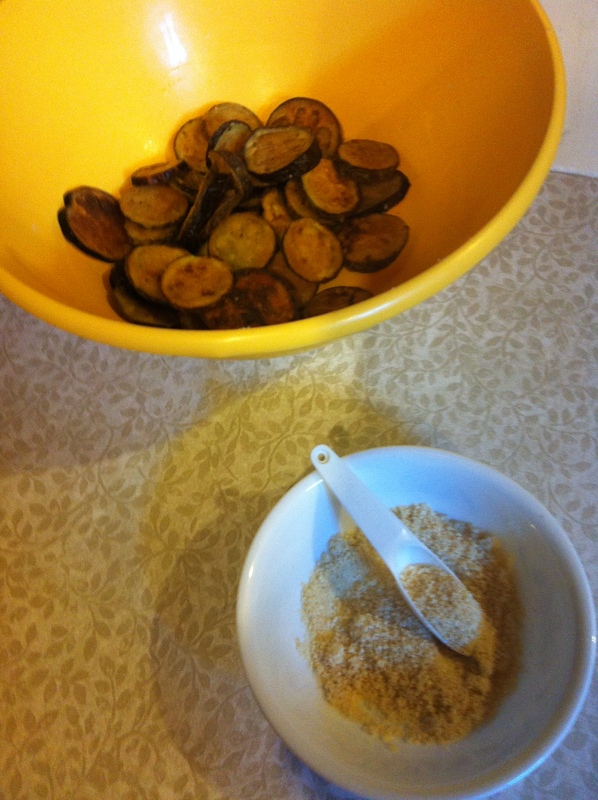 In batches, add fried pieces and sprinkle about 1 tbsp. of the sprinkle mixture into a large bowl and toss to coat the pieces. This is very subjective – if you like a super-salty treat, add more sprinkle, less, add less. Start slowly and sample (the best part of being the cook), and regulate your method according to your palate. Once the pieces are coated, arrange on a serving platter and serve immediately. If you make these in advance, you have several options. First of all, several hours later or even the next day, you can reheat these on a parchment lined baking sheet at 400 F for about 8-10 minutes until crispy, hot, and golden. You can freeze them (in a freezer bag or in a freezer-safe container – line and separate with wax paper) and use them for an impromptu appetizer, again, baking them on a parchment lined sheet. These also make an excellent quick and easy “Eggplant Zucchini Parmiggiana” – use your favorite sauce to layer these and shredded mozzarella in a glass baking dish and bake for about 25 minutes at 350, or until cheese is melted and bubbly. I serve these with Ranch or I blend a 14.5 oz. can of Del Monte Petite Cut Diced Tomatoes with Zesty Jalepeno wih 2 tbsp. extra-virgin olive oil in a BELLA Rocket Blender. Heat over medium for about 5 minutes and serve alongside the platter. 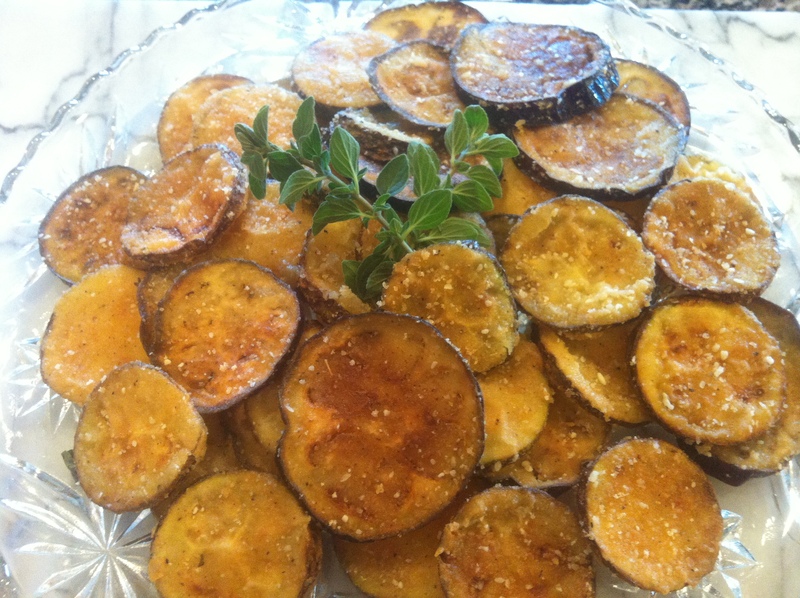 I wanted to share this recipe as we approach the summer months, when zucchini and eggplant are plentiful and everyone (including myself) begins saying, “What do I do with all of these?! ?” After everyone left last night, I needed a night-cap so I also put them on a sandwich with toasted cheese and sliced ham. They make an excellent topping for pizza, sandwiches, and salads. One recipe…infinite possibilities. BUON APETITO! Ha-ha! So glad you tried the leftover mash fry! 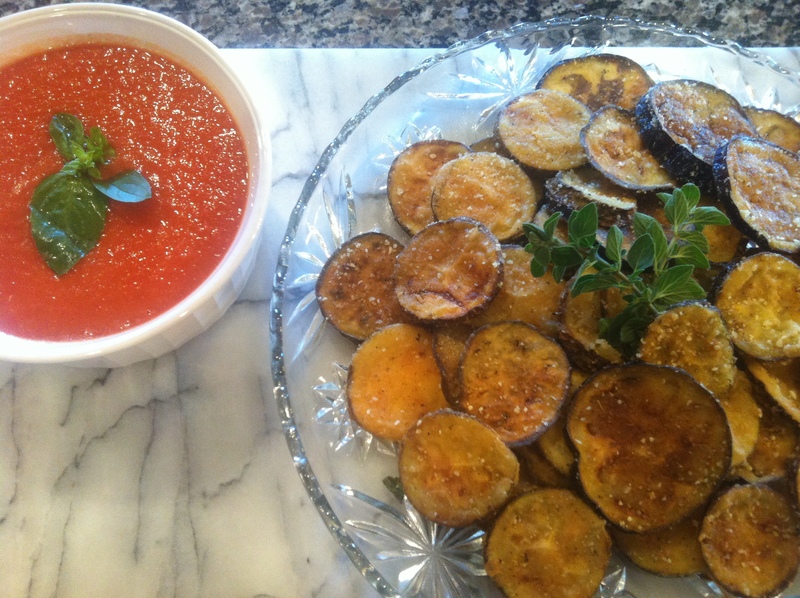 You could use any eggplant, but the small ones (like Italian eggplant) work best. 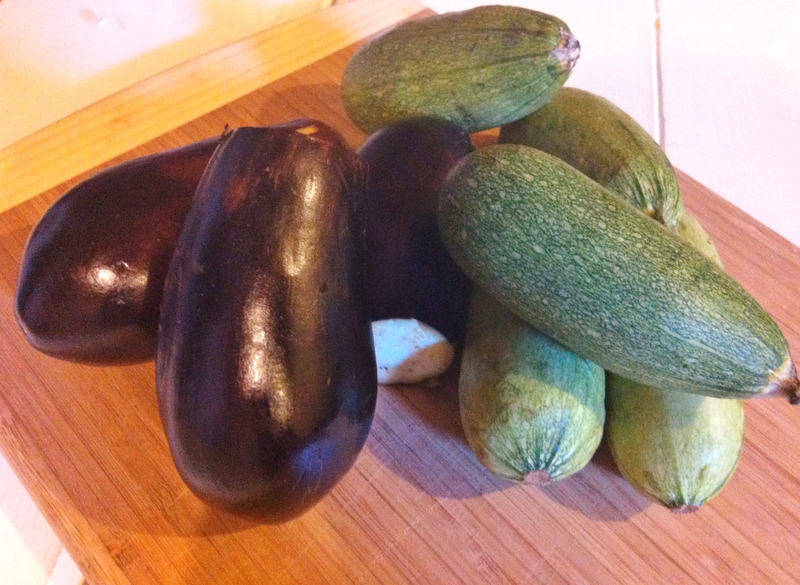 I found a website the other day with so many varieties of eggplant – I never knew so many existed! It’s one of my favorite veggies. Planting on Saturday in the garden (I’m off to a late start but hoping for a big harvest! ).